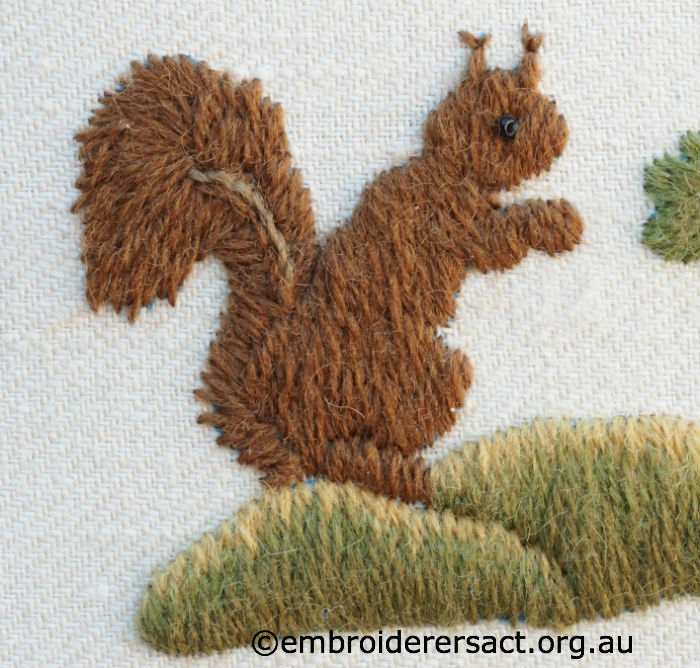 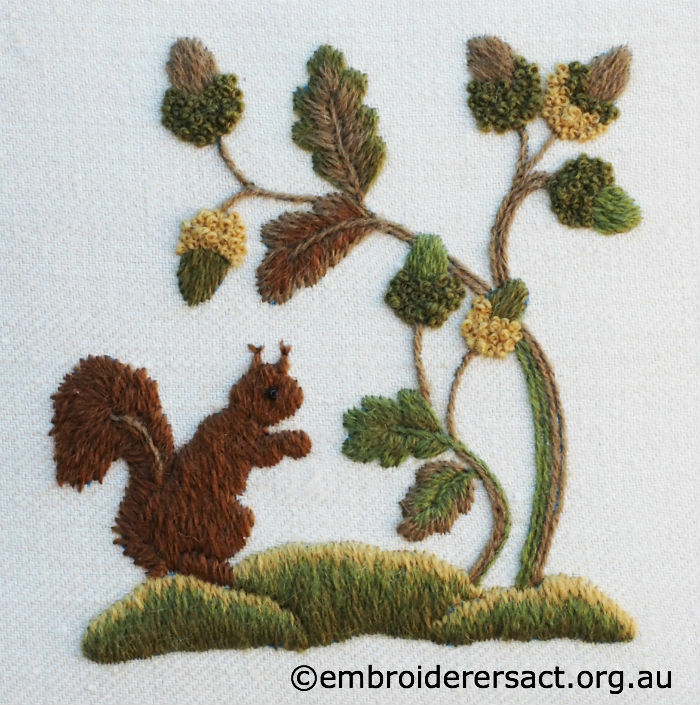 In this post we’re going to share a charming crewel embroidery of a squirrel with acorns. 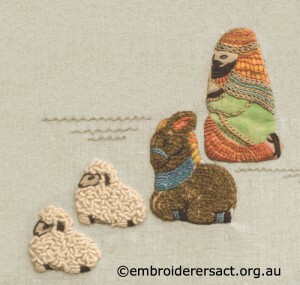 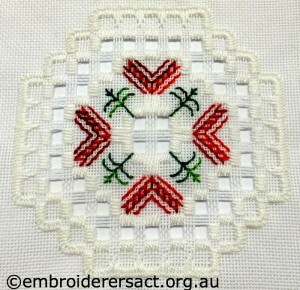 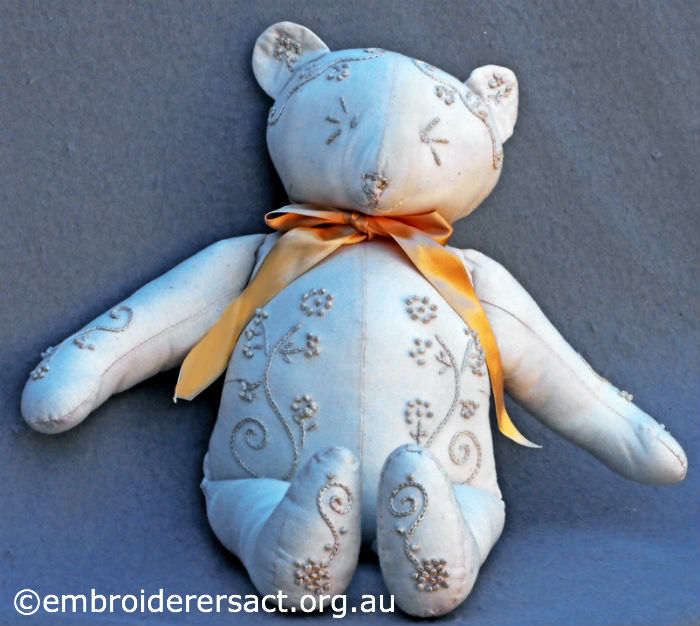 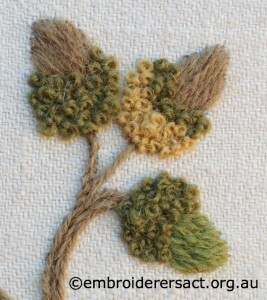 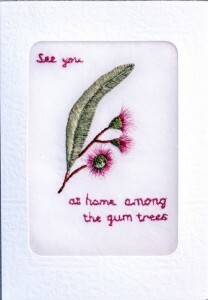 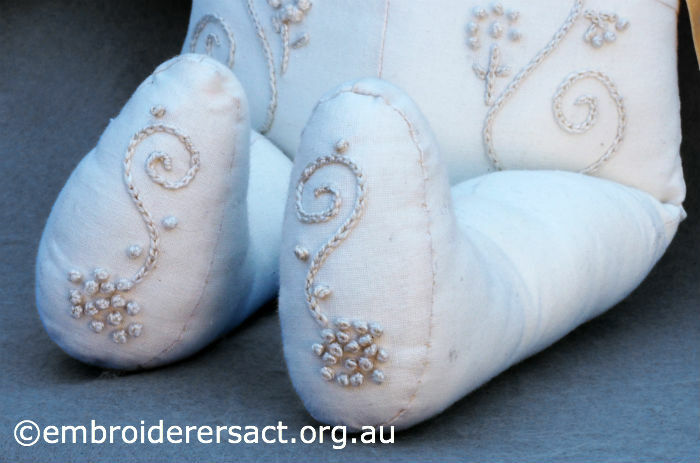 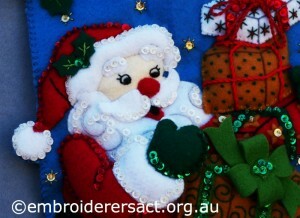 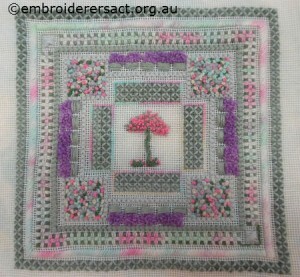 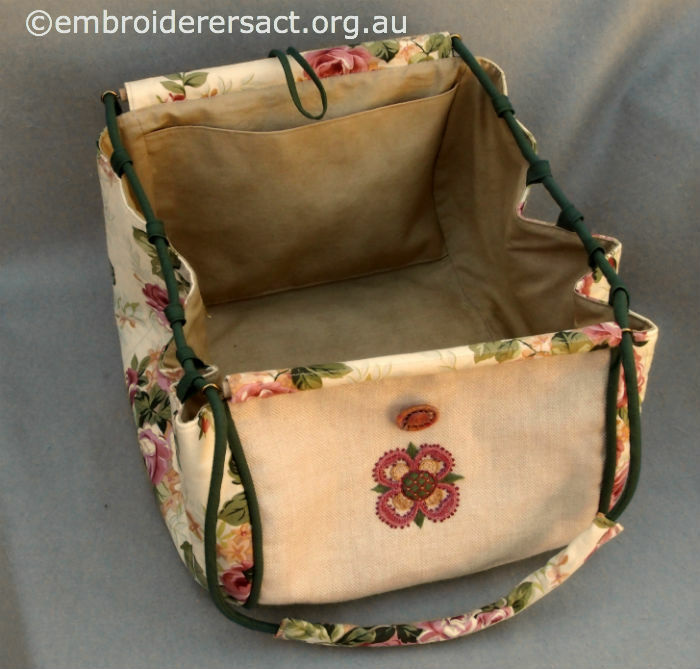 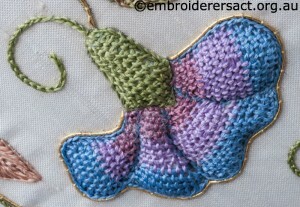 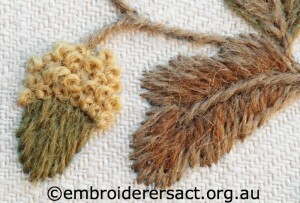 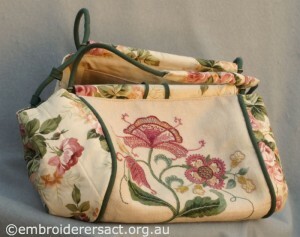 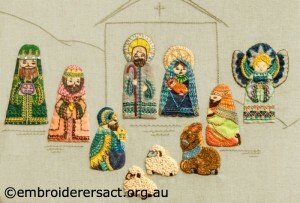 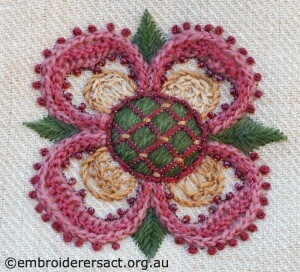 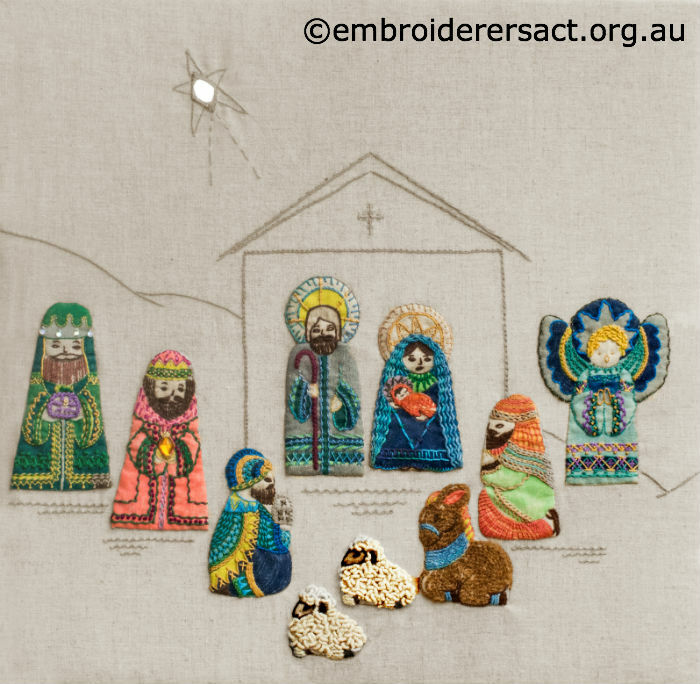 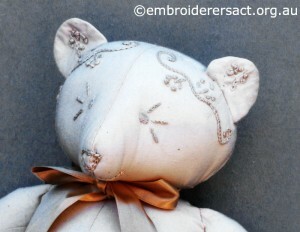 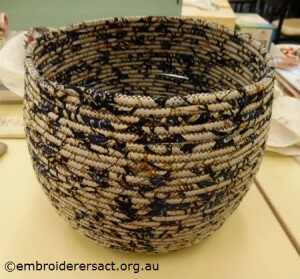 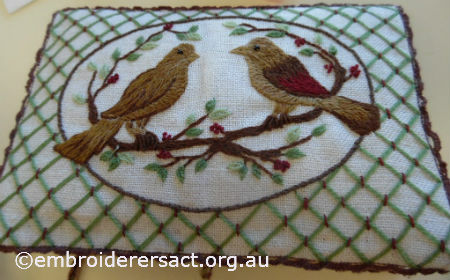 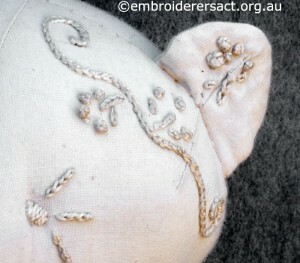 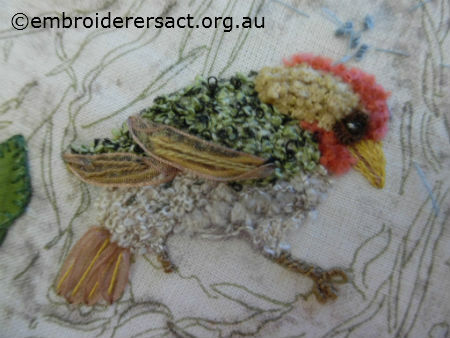 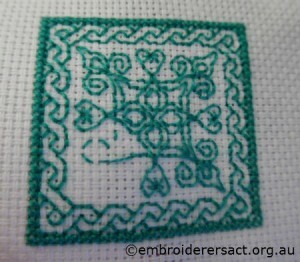 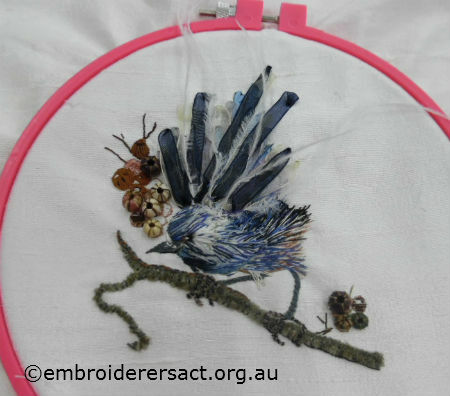 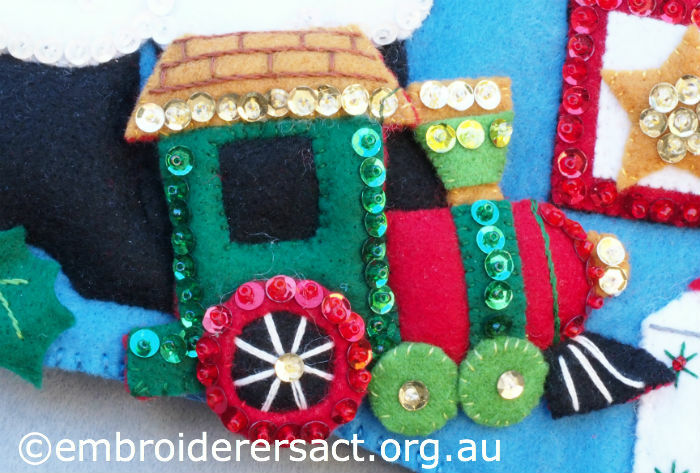 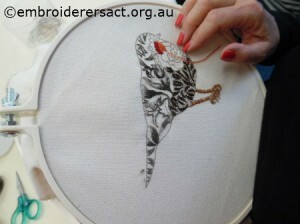 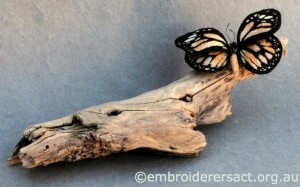 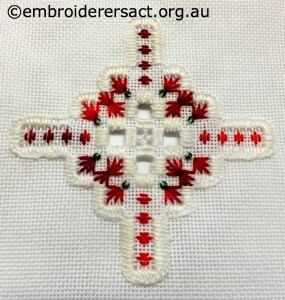 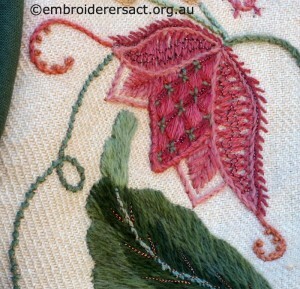 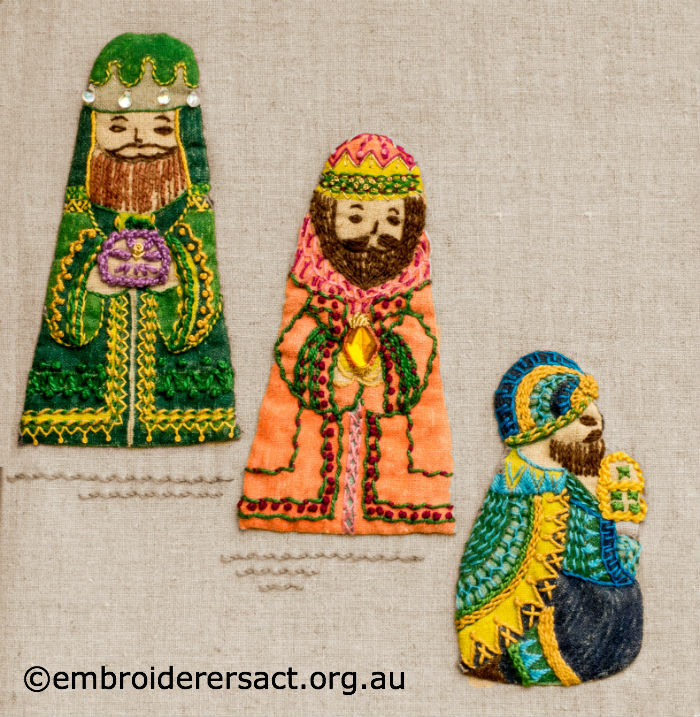 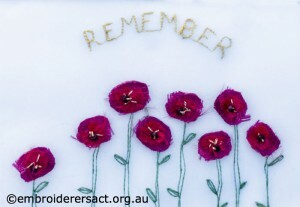 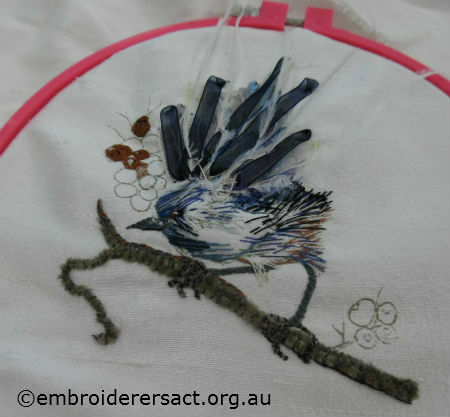 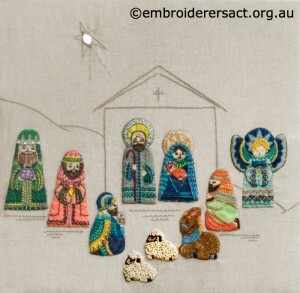 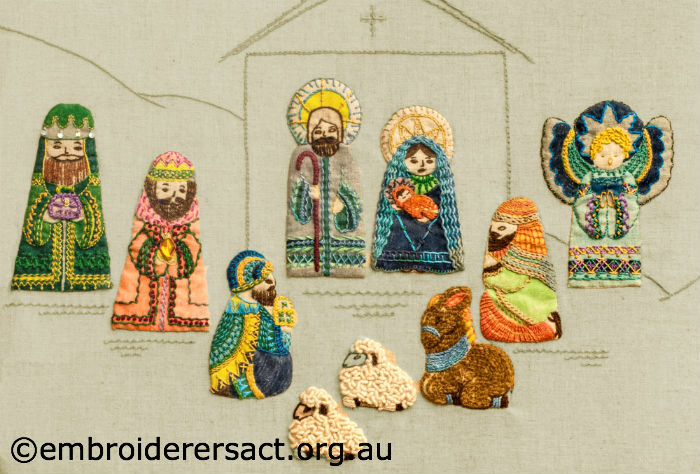 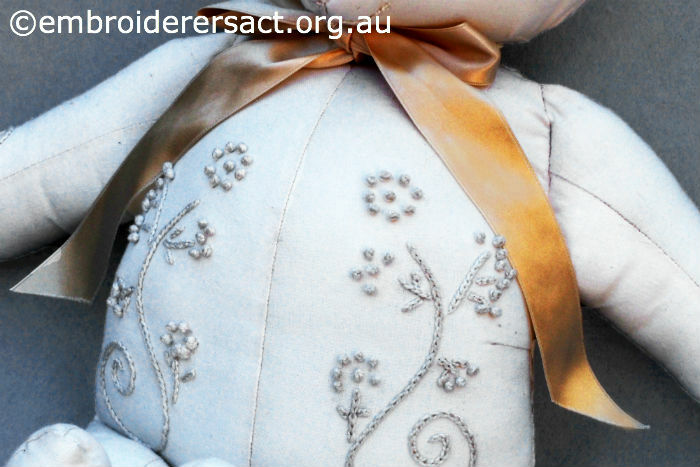 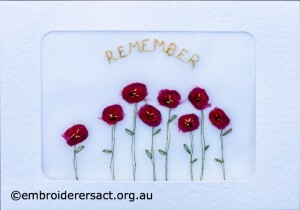 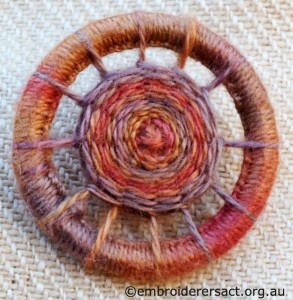 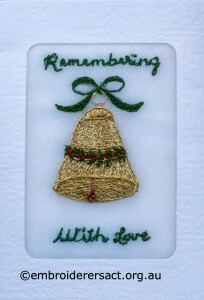 It was stitched by Jillian Bath in a class with Phillipa Turnbull at Koala Conventions a few years ago. 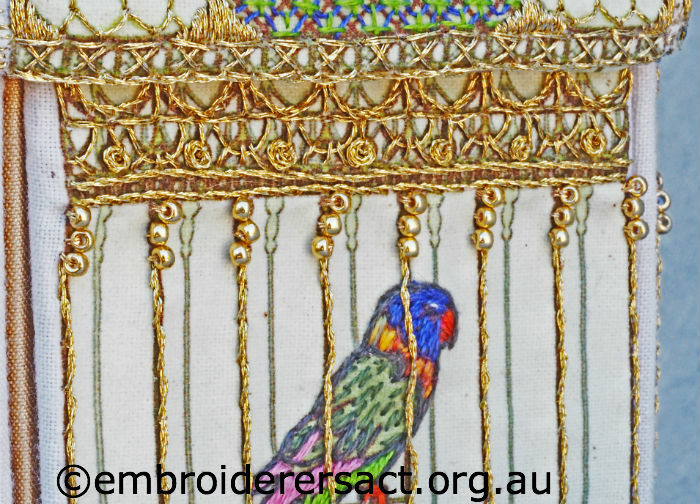 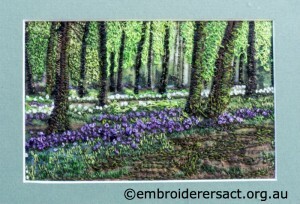 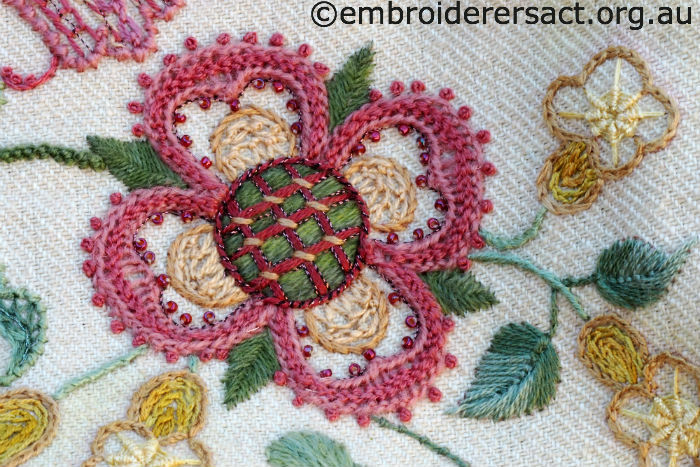 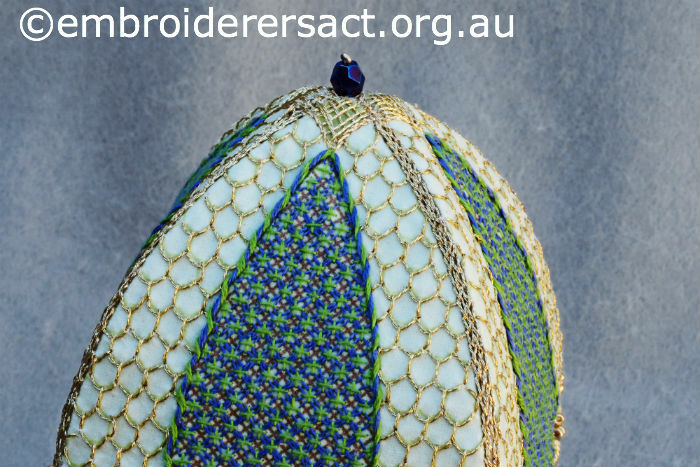 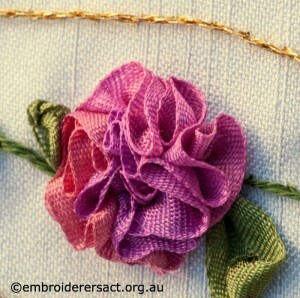 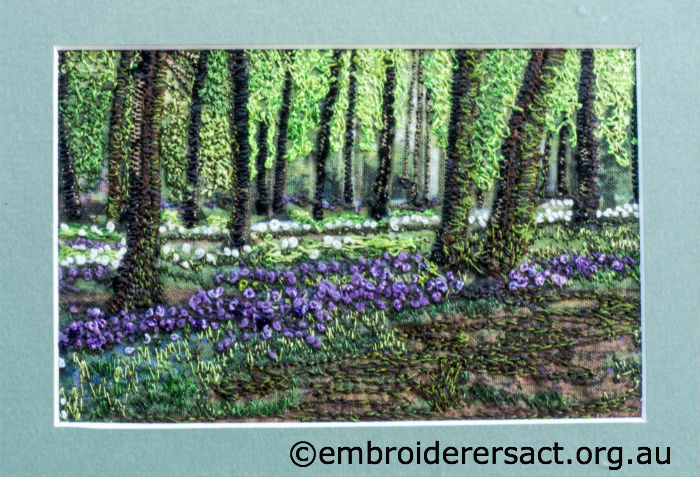 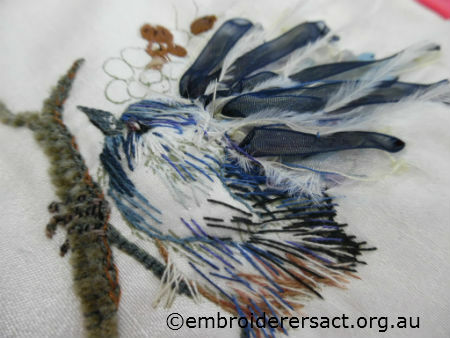 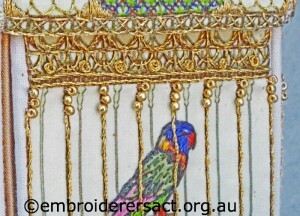 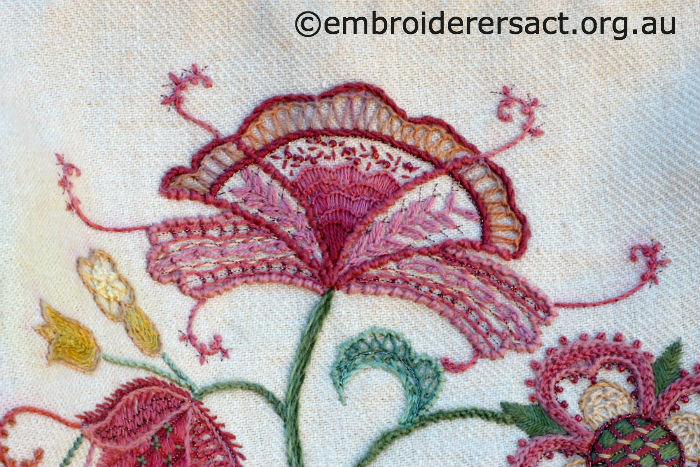 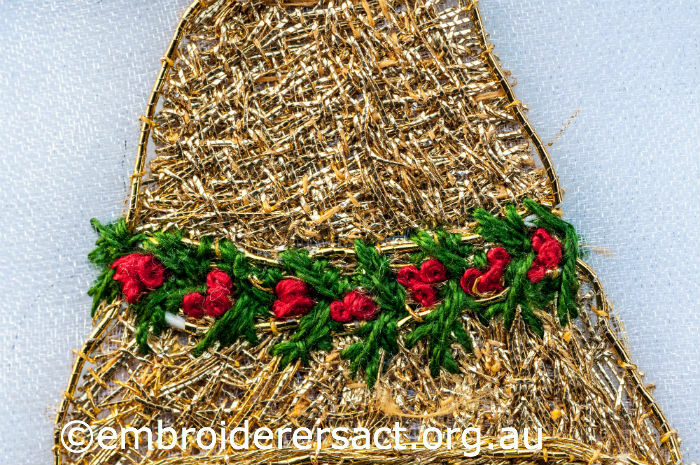 I’ve just been looking through the awesome program of workshops & classes for the Embroiderers’ Guild of America’s Seminar 2015. 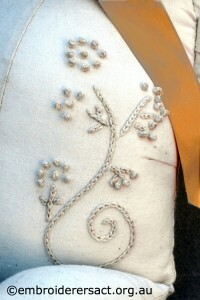 It’ll take place from 28 October to 1 November in San Antonio, Texas. 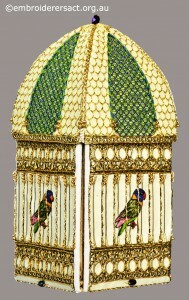 One of the classes that caught my eye was a Bird Cage by Australian designer Gary Clarke. 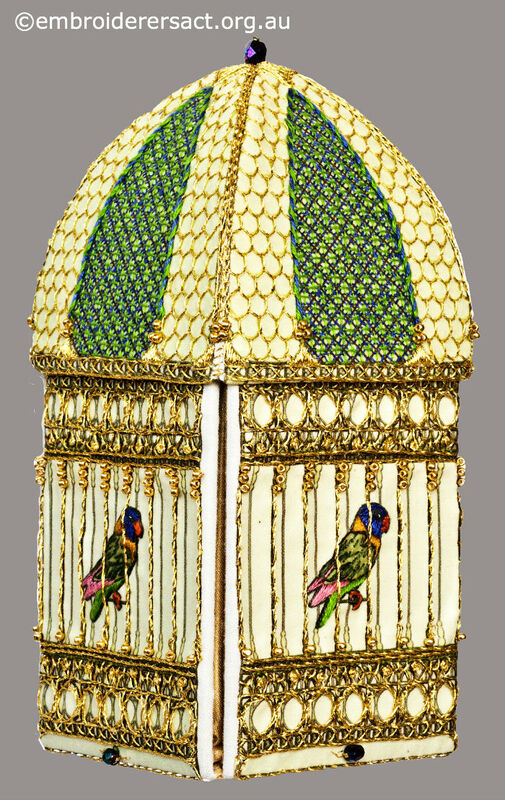 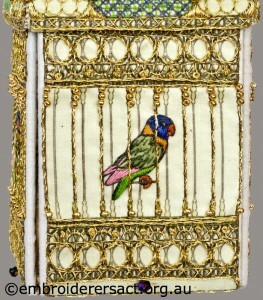 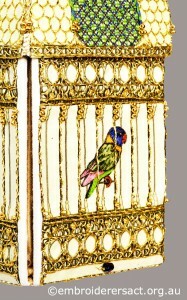 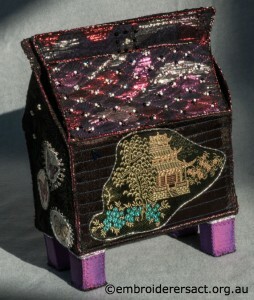 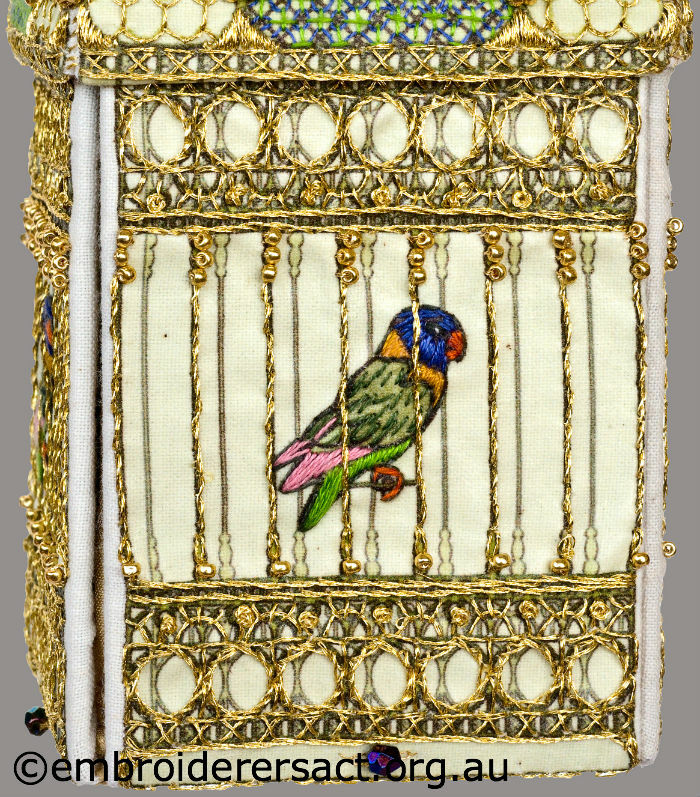 In the class notes it’s described as a needle accessory disguised as a grand Victorian 3D bird cage. 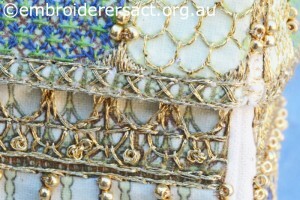 As it’s Australia Day later this month it’s great to be able to feature an Australian designer. We can do this because the super talented Jillian Bath has stitched this piece and her husband Stewart has taken some fantastic photos. 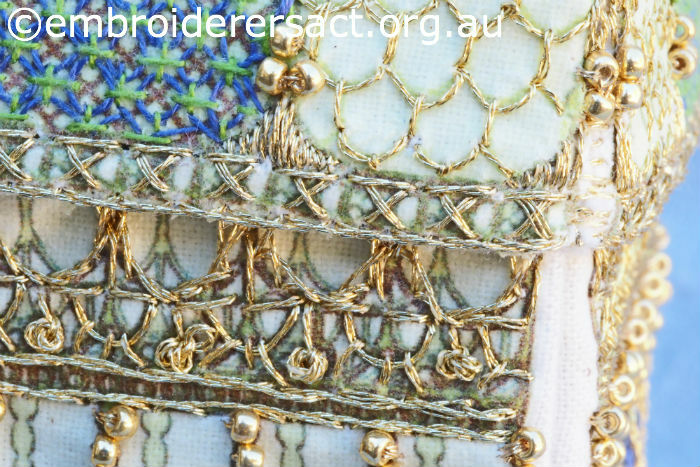 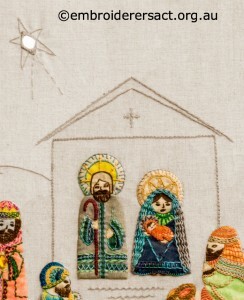 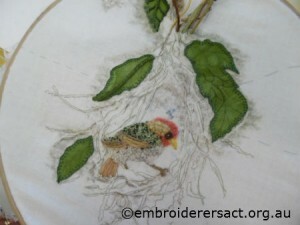 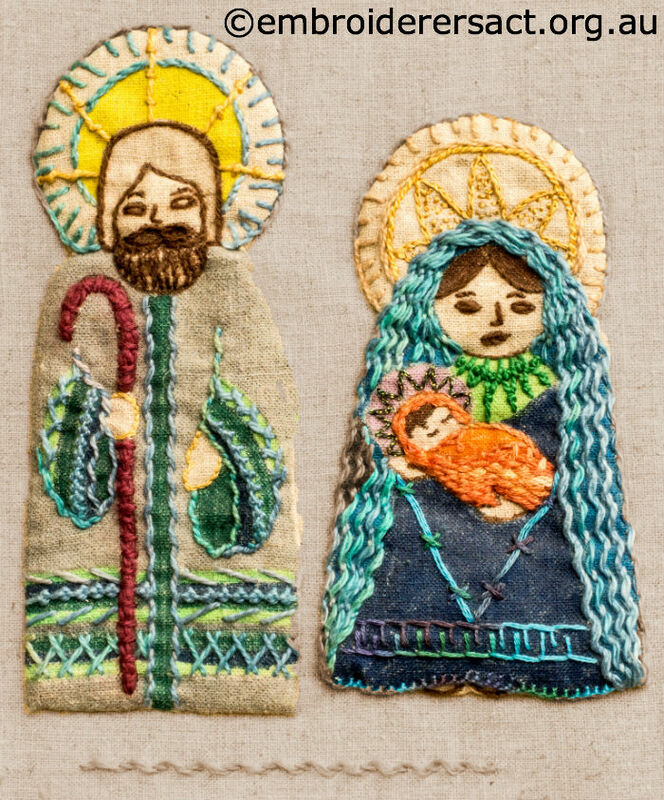 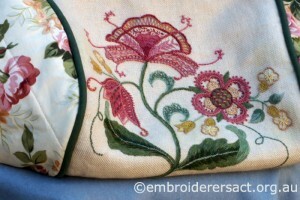 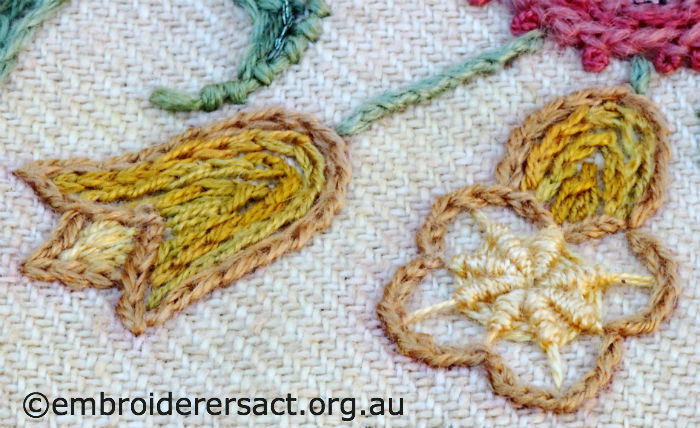 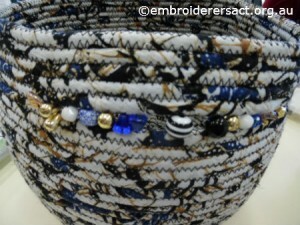 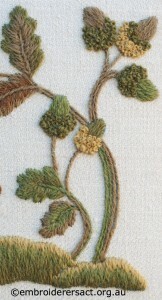 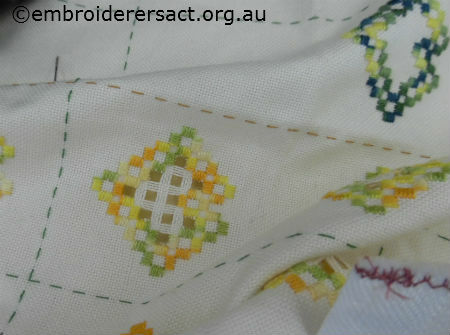 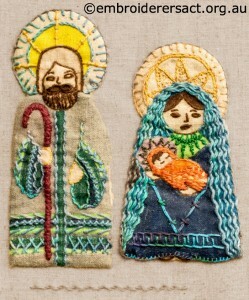 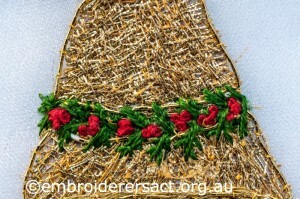 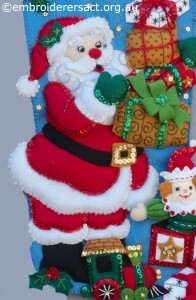 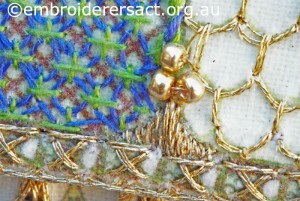 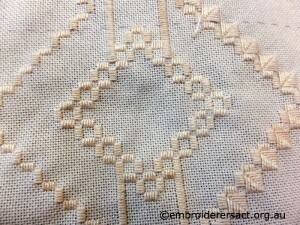 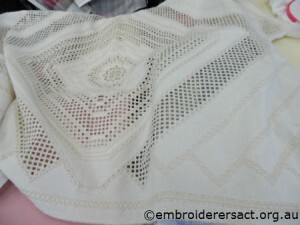 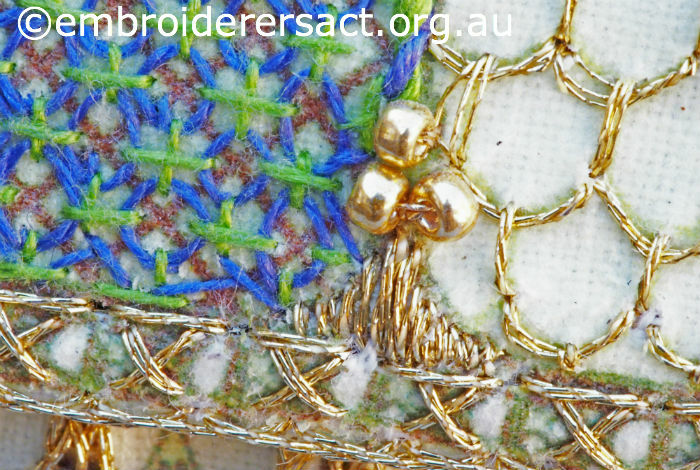 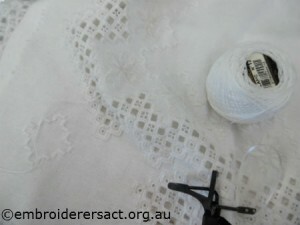 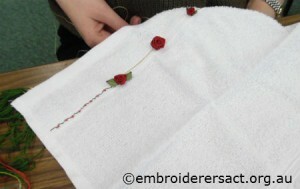 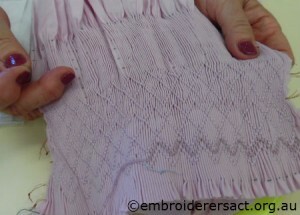 There are some great close-ups of the needlework for those of you who love a really good look at the detail. 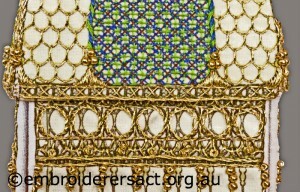 Exquisite isn’t it? Thank you Jillian & Stewart for sharing the beauty of this design with us. 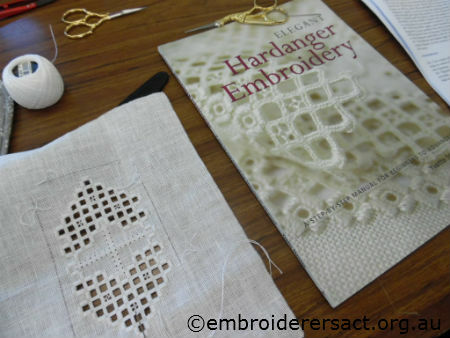 If you’d like to read more about the EGA’s Seminar 2015 then go to their website here. 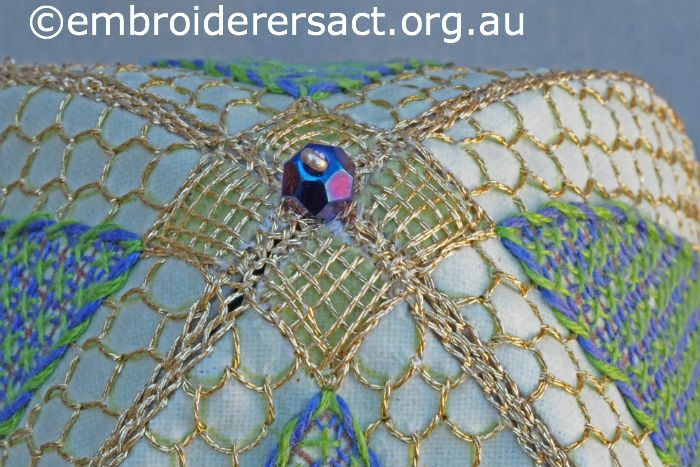 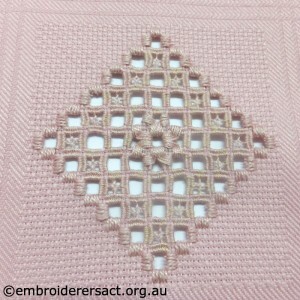 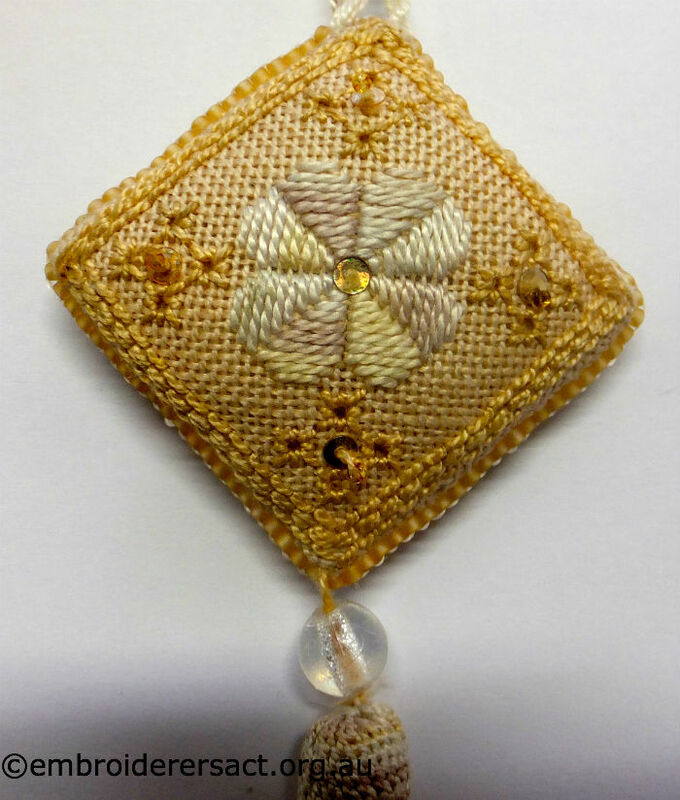 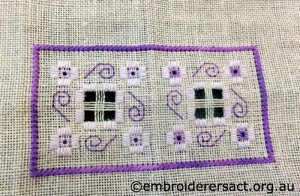 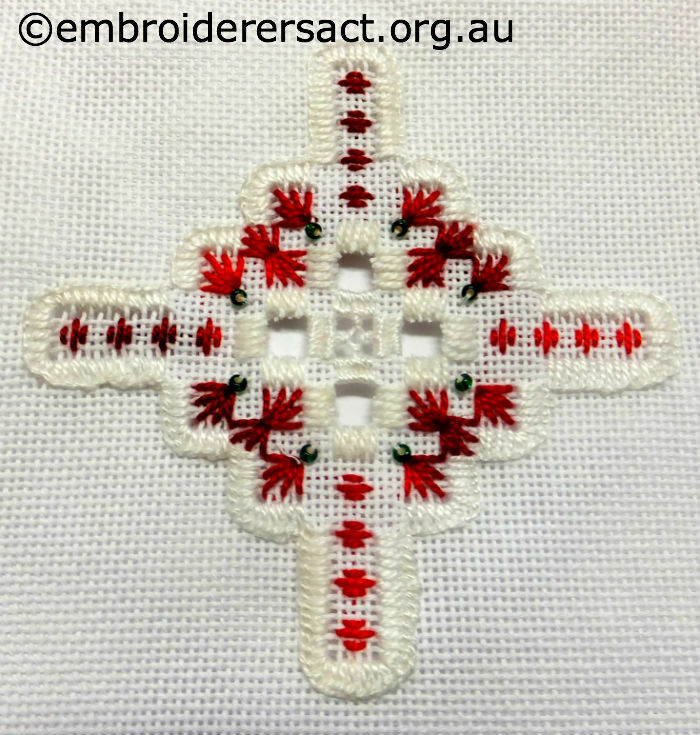 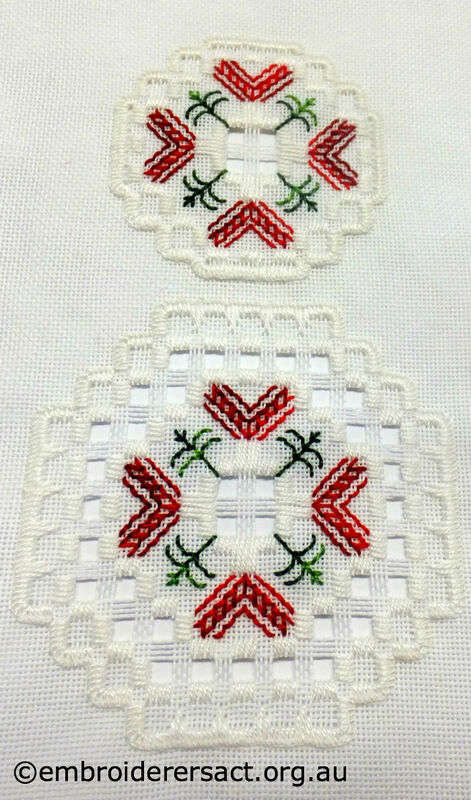 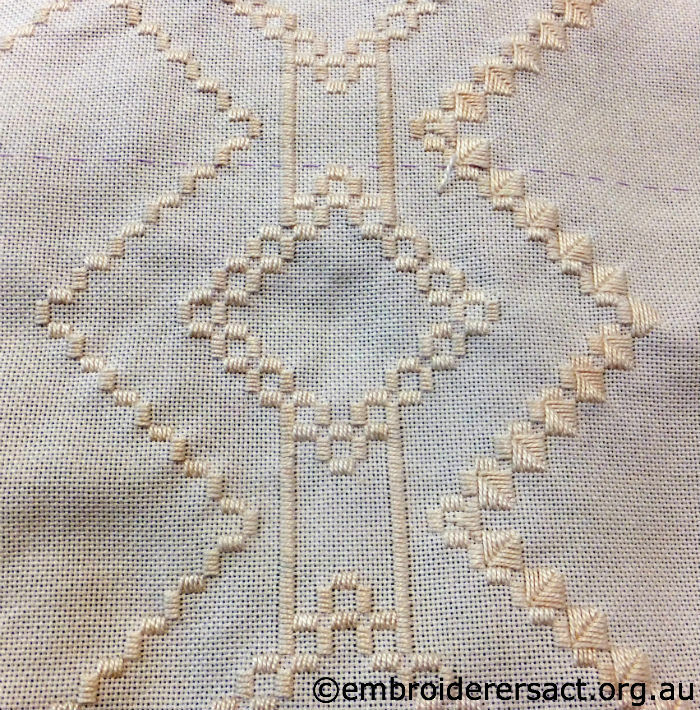 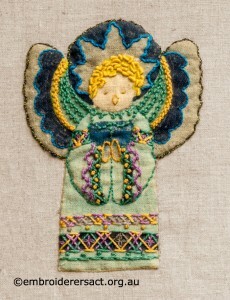 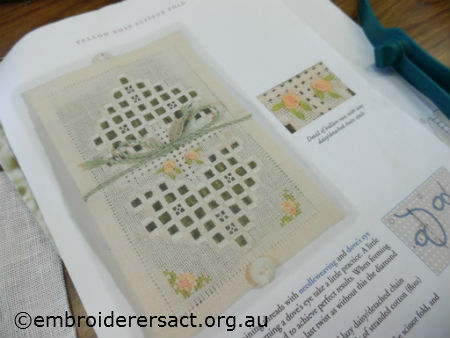 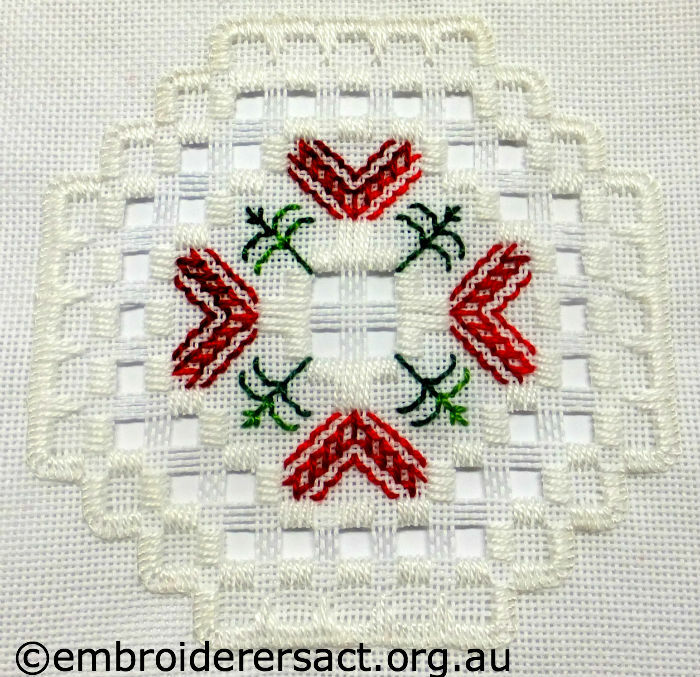 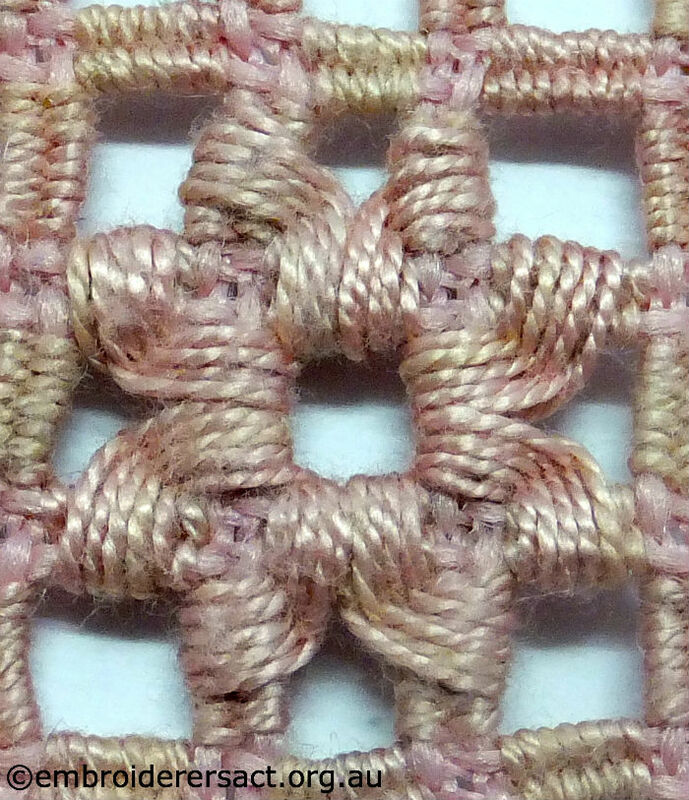 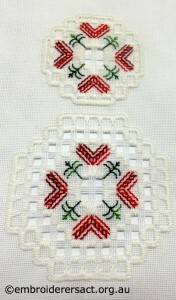 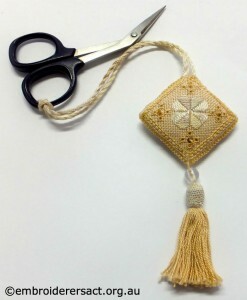 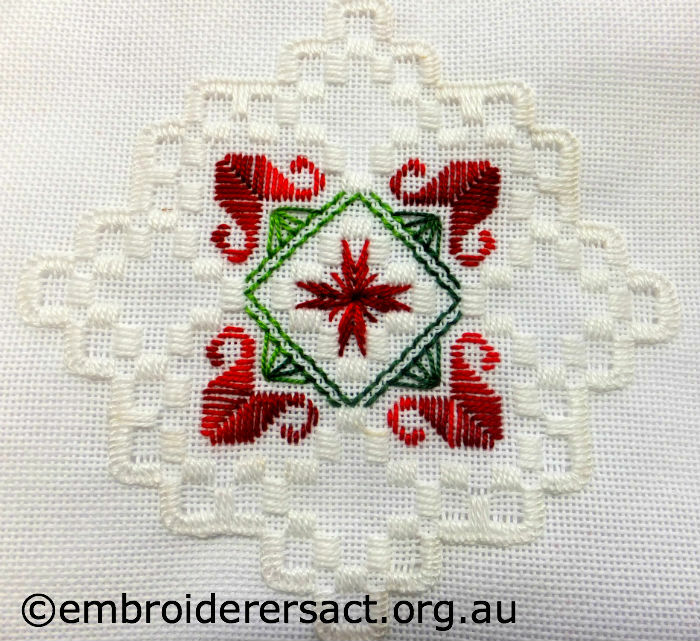 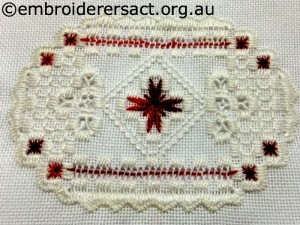 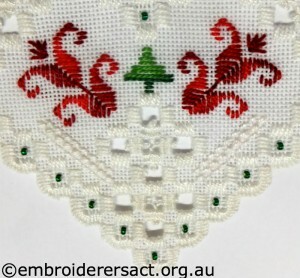 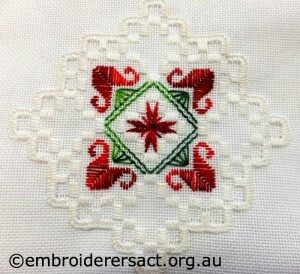 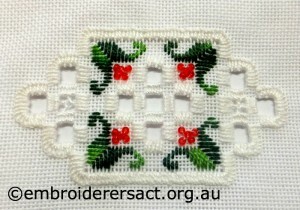 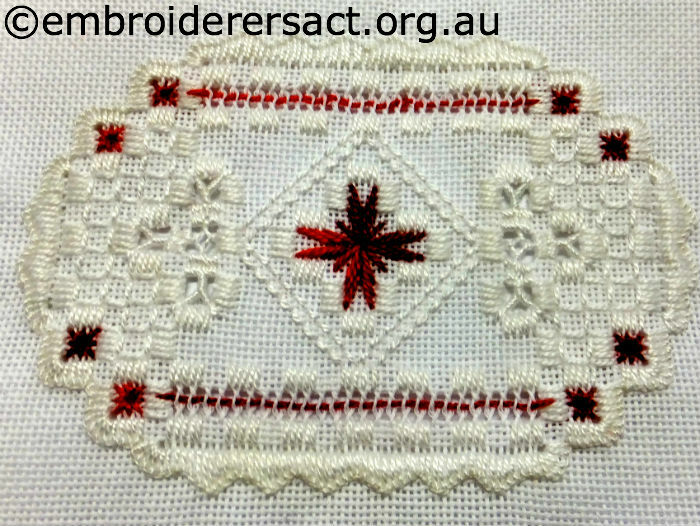 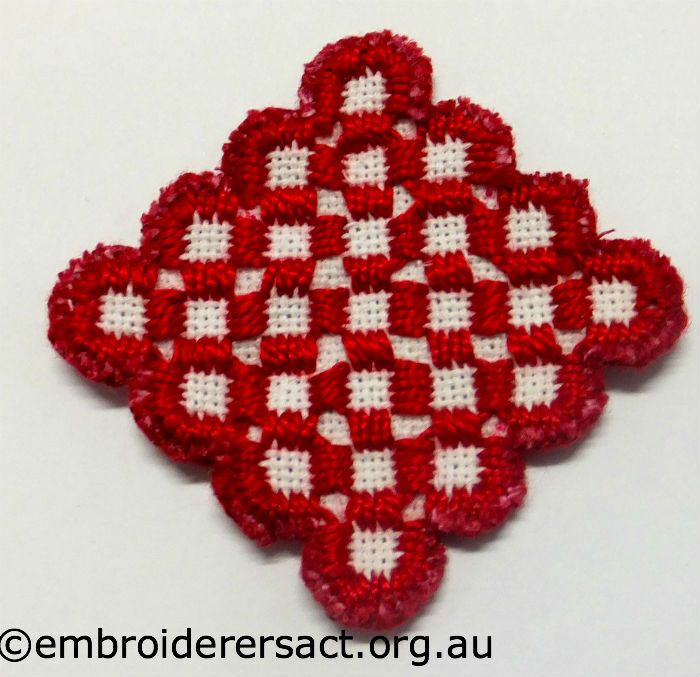 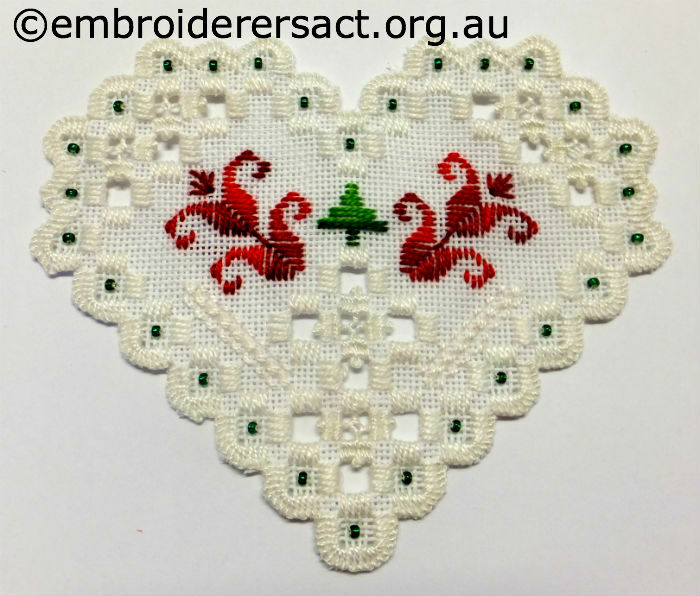 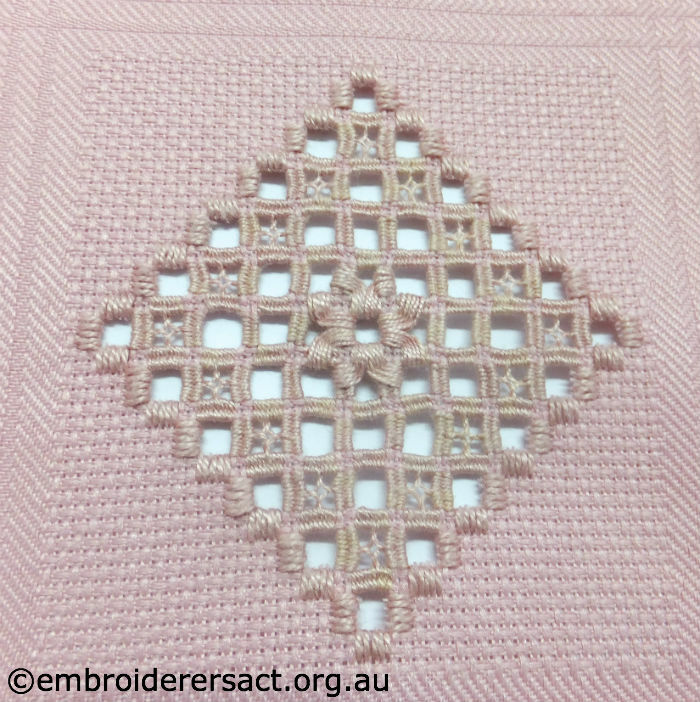 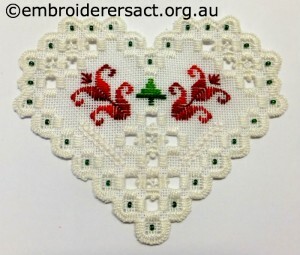 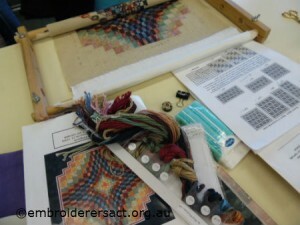 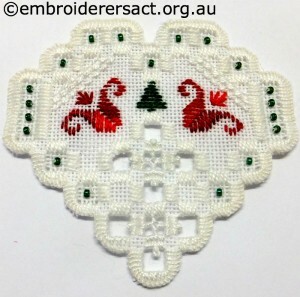 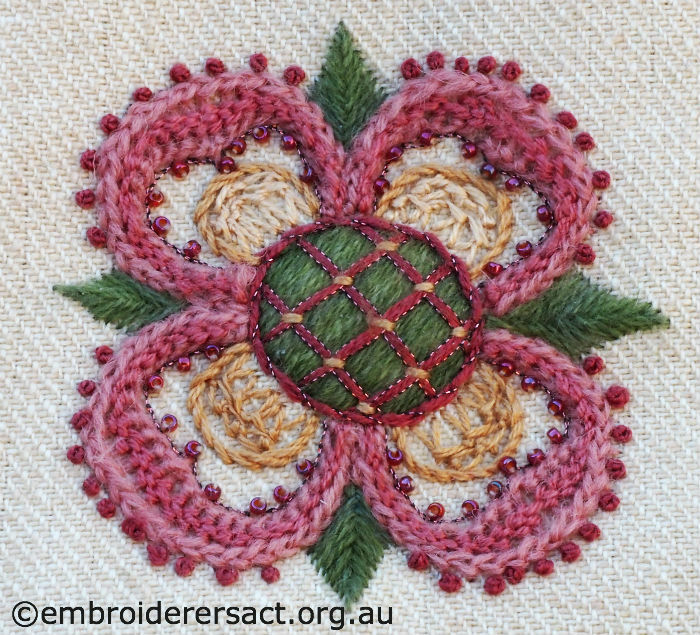 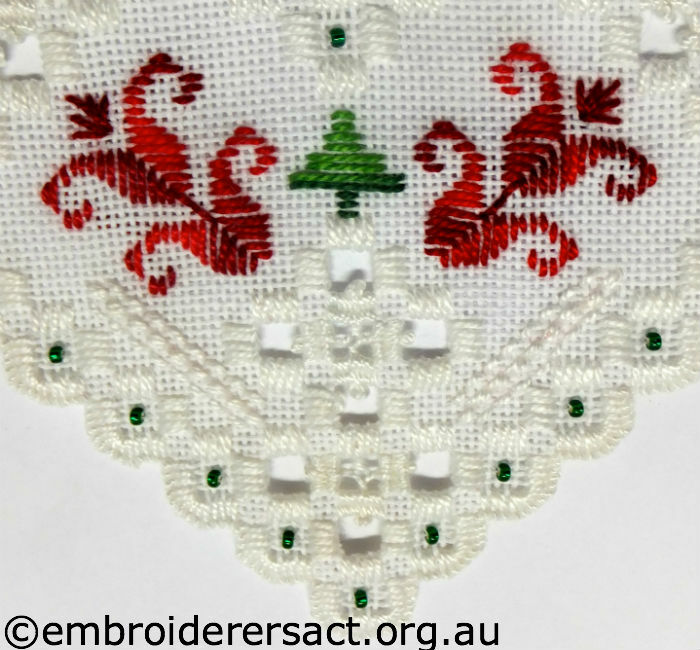 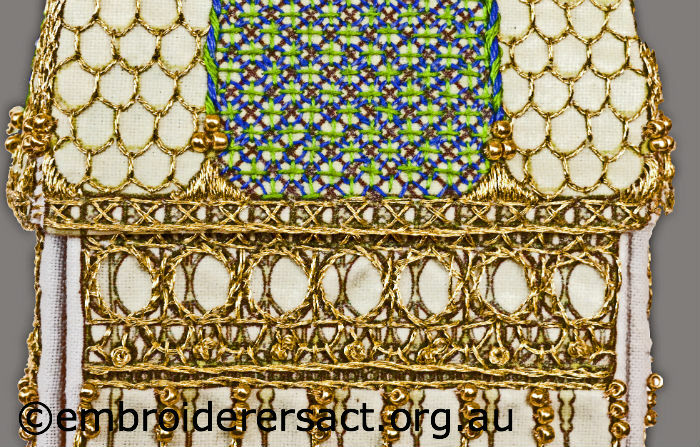 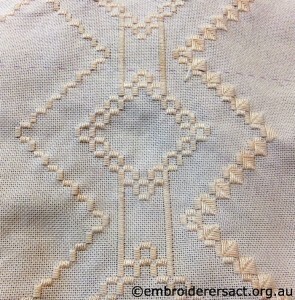 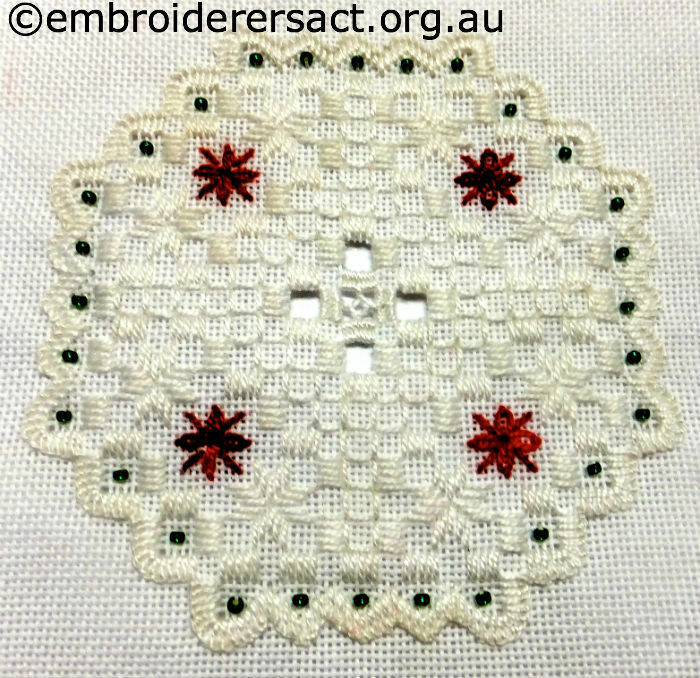 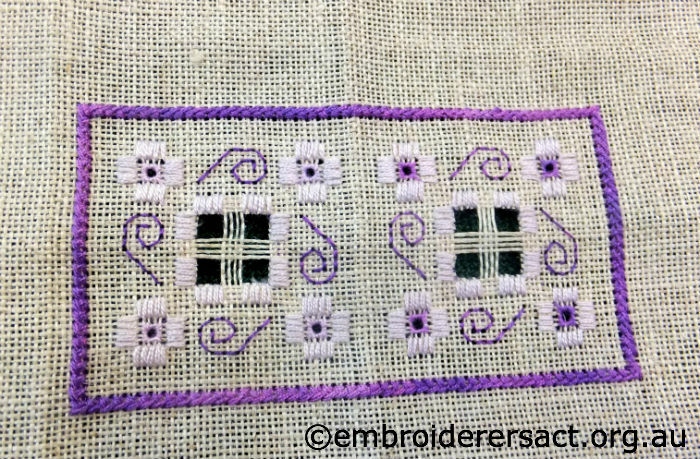 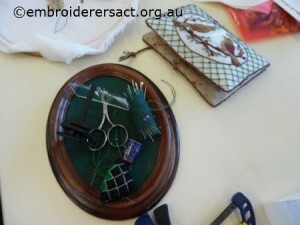 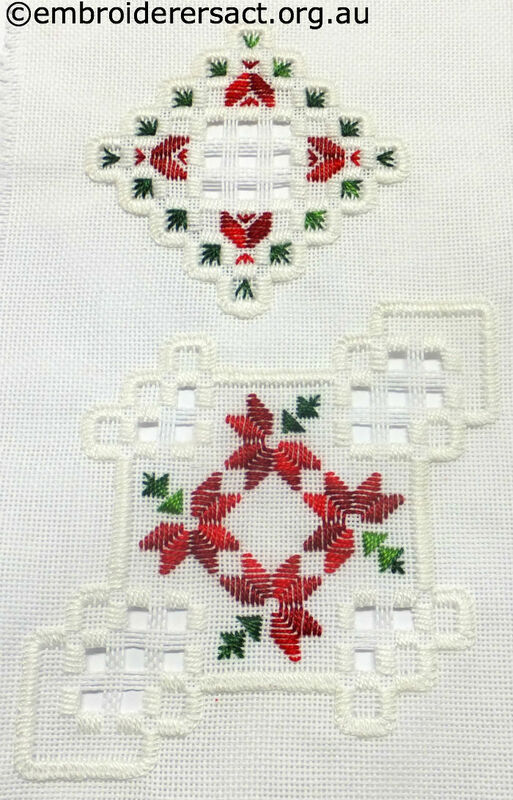 The Hardanger Group of the Guild meets on the second Saturday of the month – it’s a lively bunch of people who just love stitching this technique. 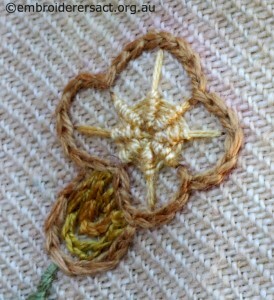 There are all levels of expertise with a common thread of enthusiasm and friendship. 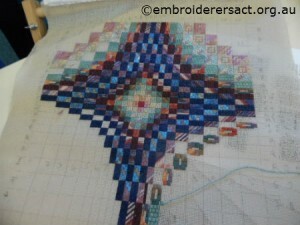 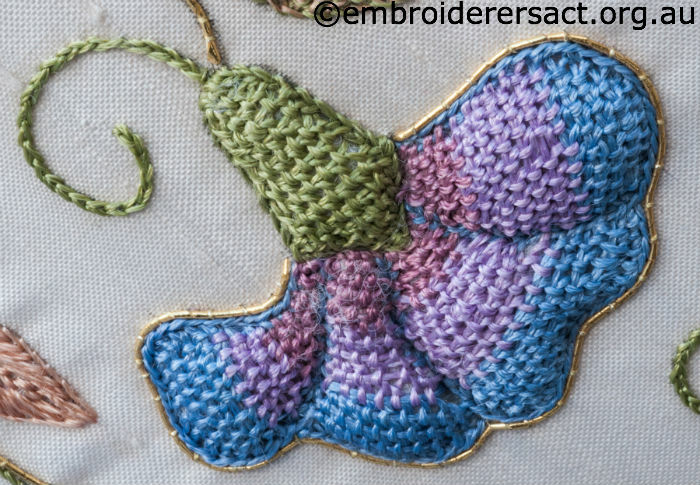 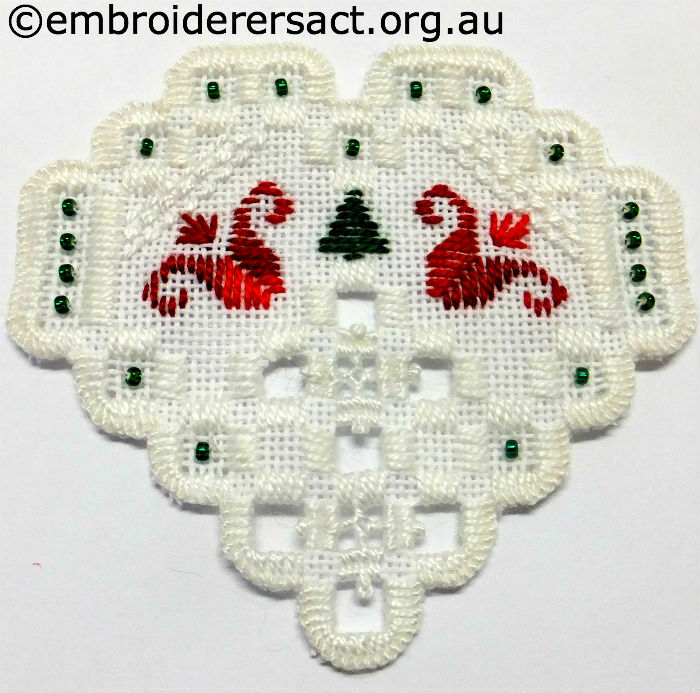 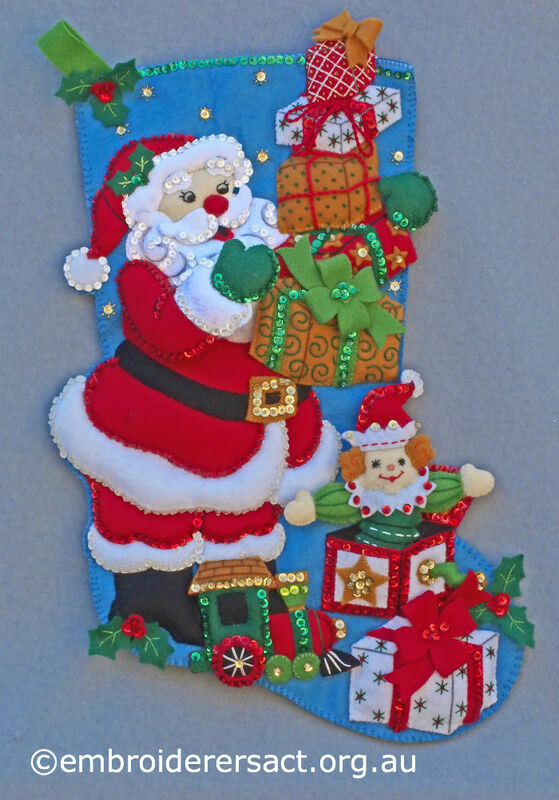 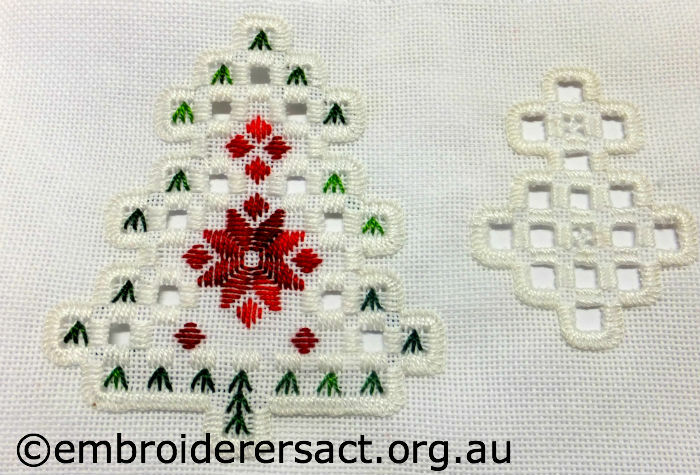 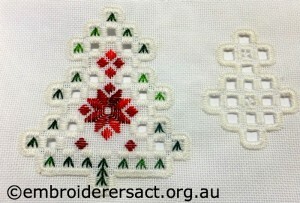 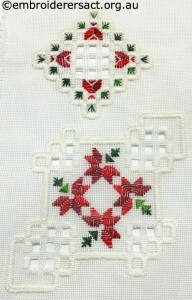 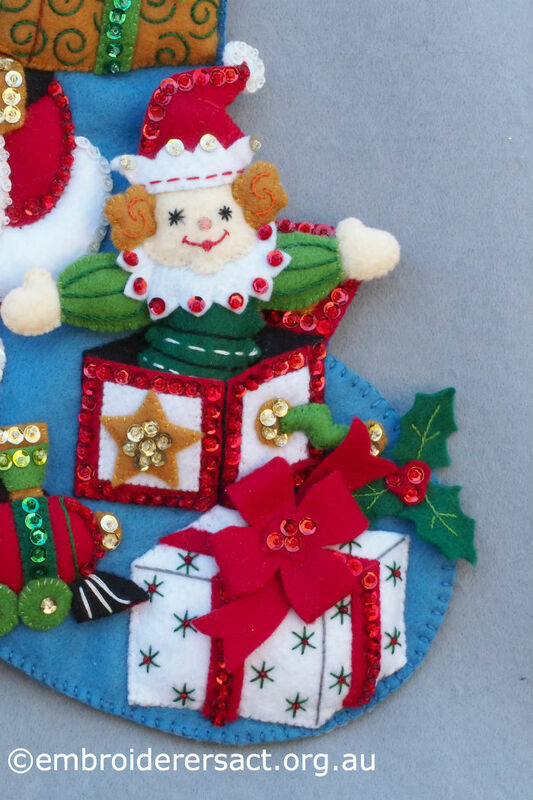 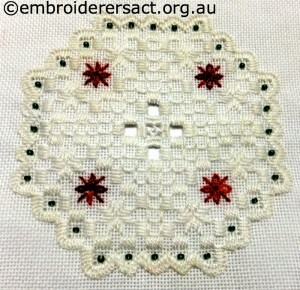 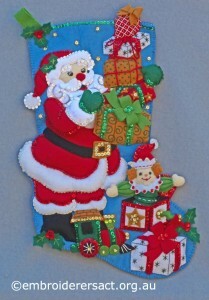 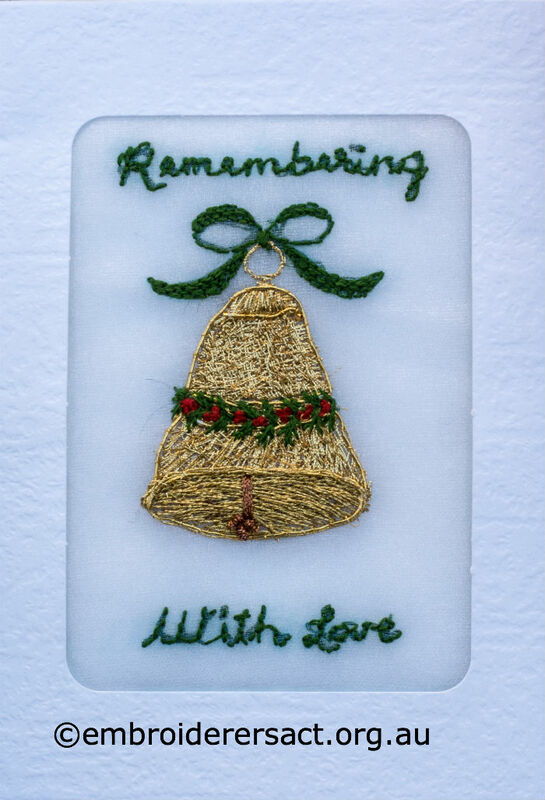 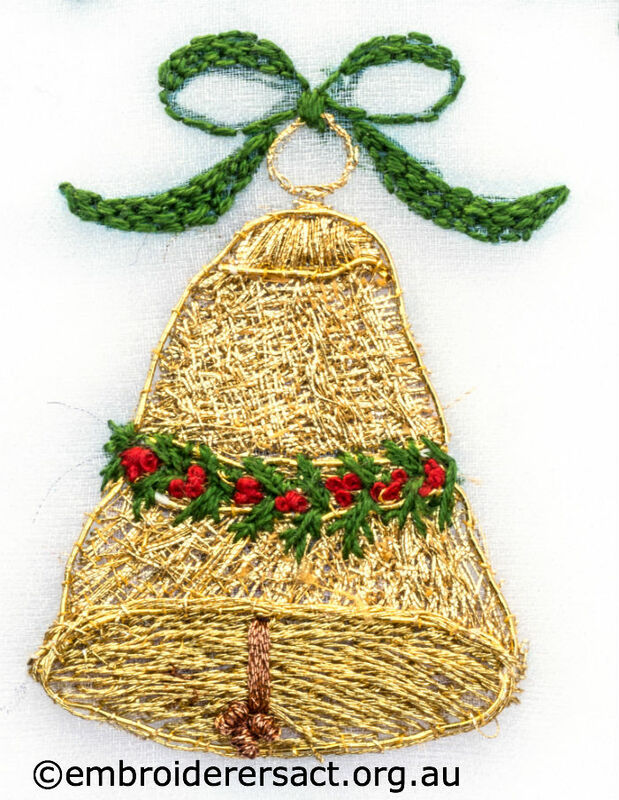 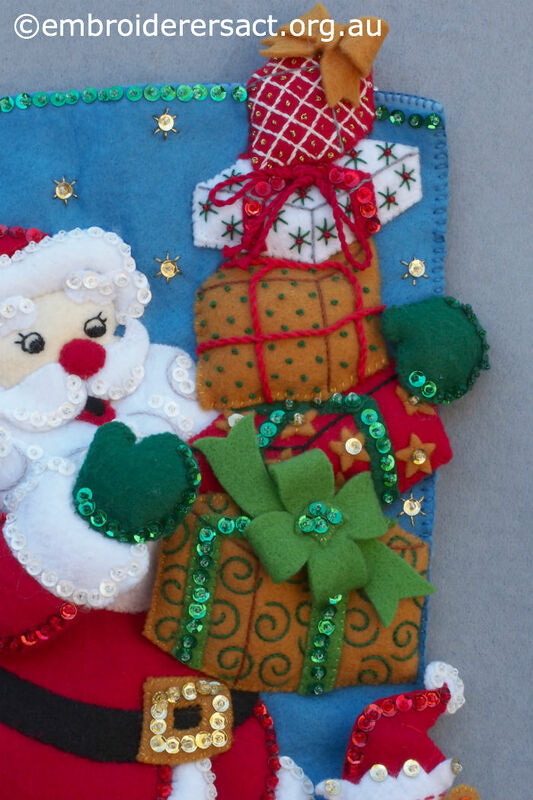 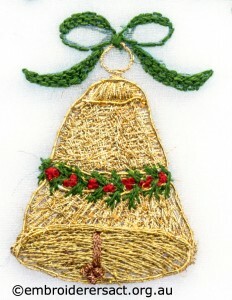 Jillian Bath brought along a selection of the sample ornaments she’s been stitching as part of a Hardanger Ornament Club with Nordic Needle – she wanted to share her progress and the fun, pretty seasonal designs.